Many courses in the OC Learning Center will have at least one discussion forum. Forums allow participants to discuss certain topics in a delayed conversational form. All that this means is that you’re able to talk to other students even if they are not currently on the OC Learning Center. You may begin a conversation and an hour later one of your participants logs in and replies to your comments. This can be especially useful when some participants are offline when the conversation begins. The conversation is preserved and they can contribute at a later time when they happen to be logged in. To subscribe to a forum simply means that you get email notifications whenever someone contributes to the conversation. If you are involved in several different forums and discussions, this can be essential to maintaining your sanity. In this How-To we’re going to subscribe to a discussion forum. Watch this video or follow the step-by-step below. 1. Head to the OC Learning Center. 2. Enter one of your courses that has a discussion forum. 3. Click on a discussion forum. You can recognize a forum by the icon . 4. In the left column, you’ll notice a block called Settings. Scroll down the page if you don’t see it. 5. 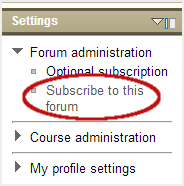 Click on “Forum Administration” to view the options. 7. You will now receive emails whenever someone contributes to this forum. Note: You must subscribe to each forum separately. This entry was posted in How-Tos and tagged forum, subscribe. Bookmark the permalink.